DISCONTINUING - this is the end of the line for one of our favorite tapes! 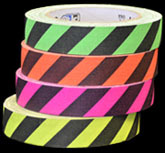 Patterned Gaffer Tape for Route Marking on Climbing Walls. 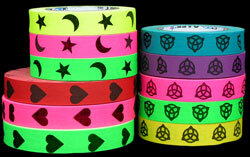 Gaffer tapes printed with distinctive symbols and patterns are used on indoor climbing walls for route-marking. Symbols include Diagonal Stripes, Stars & Moons, and Yin-Yangs. All are helpful to climbers who are color-blind. Gaffer tape removes cleanly, has a non-reflective matte finish, great conformability, and tears easily into shorter strips.